Santa Cruz native, Ashley Held, is the second surfer in our Surf Angel series. At 17 years old, she has etched her place into the local surf scene and earned a well deserved spot in the lineup. Ashley has been raking in the first place trophies at numerous contests up and down the coast, including her latest victory in pumping waves at the NSSA West Coast Regionals at Huntington Beach. Ashley’s sponsors include, Volcom, Janga Wetsuits, Sol Life Surfboards, Santa Cruz Skateboards, and Arnette. AH: Surfing has given me so many new experiences including traveling to new places, many new friends, competitive experience, and great opportunities. BnB: Any words of Wisdom? AH: “I surf to get tan” (Shane Dorian). BnB: What is your local surf spot? 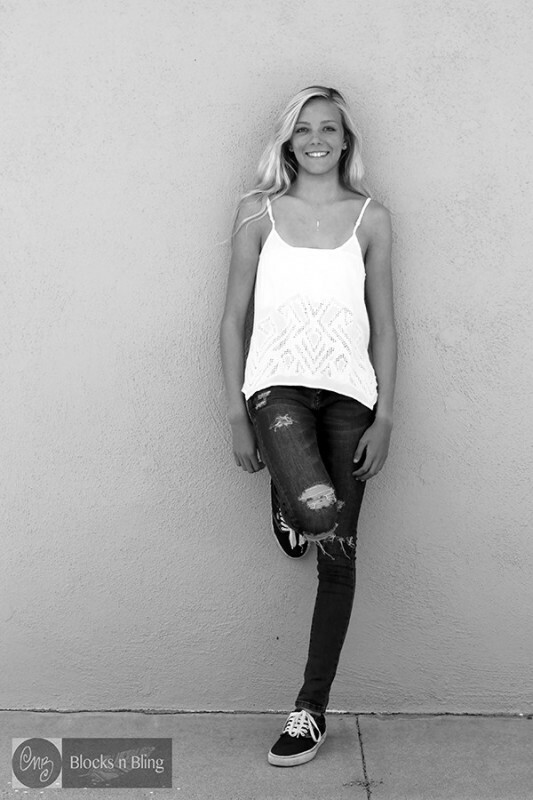 BnB: Do you have a female surfer who you look up to or admire? AH: Carissa Moore kills it with her rail and air game. AH: I want to learn how to snowboard! Ashely is wearing Volcom clothing provided by Freeline surf shop, and Accessories from Zen Island. Styled by Blocks-n-Bling, fashion photography by Nikki Brooks, surf photography by Nelly. Watch the behind the scenes video of the photo shoot HERE. This entry was posted in Fashion Slice, Featured, Local Loop and tagged in blocks-n-bling, fashion, Freeline, Nikki Brooks, surf angel, surfer girl, Zen Island. Bookmark the permalink. Wonderful photos, model, fashions & write up.